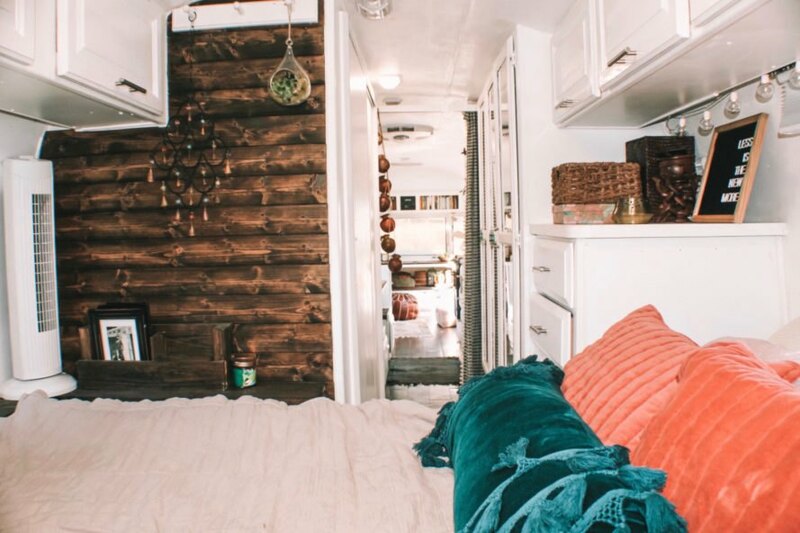 While they were dating, travel-loving couple Nate and Taylor Lavender bonded over their shared dream of tiny home living. 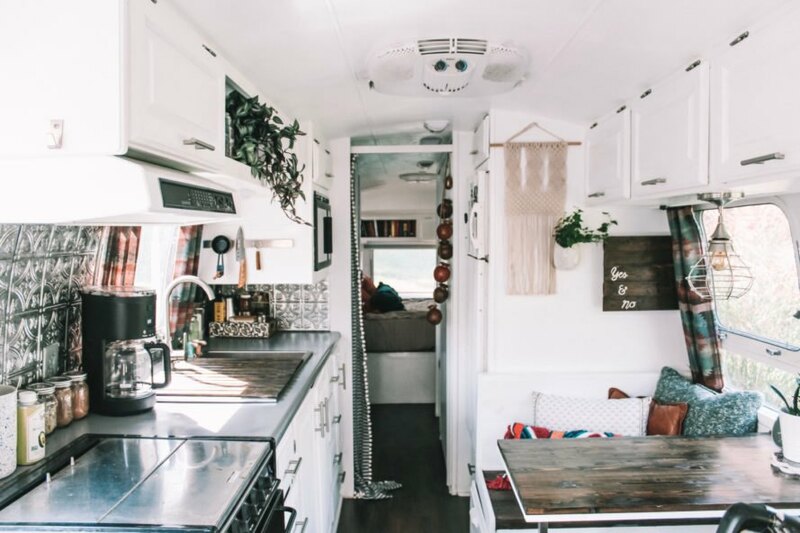 Years after they met, the ambitious duo decided to bring that dream to fruition by converting a 1992 Airstream into a bohemian, light-filled home on wheels, renamed Augustine the Airstream. Today, the couple, along with their incredibly cute dog Summit, are enjoying the freedom of life on the road. The couple did most of the renovation work themselves, starting with the exterior. Airstreams are known for their shiny aluminum cladding, but Augustine’s nearly-30-year-old exterior had a dull, weathered appearance. To restore its luster, the Lavenders used two rounds of paint stripper before buffing and polishing it back to its shiny gleam. Renovating the Airstream‘s interior, which was pretty shabby, was also quite an arduous task. Stripping the interior to the bone, the couple began to create a new layout that would work best for their lifestyle. They both work from home, so it was essential to create a work space and plenty of storage to keep the interior clutter-free. The couple decided to keep the interior’s color palette neutral with just hints of color. They painted the walls white and installed lightweight, peel-and-stick vinyl plank flooring. To make the most of the compact space, Nate custom-built most of the furniture, including the booth table in the kitchen, the side table next to the sofa, a shelving unit and the bed frame. 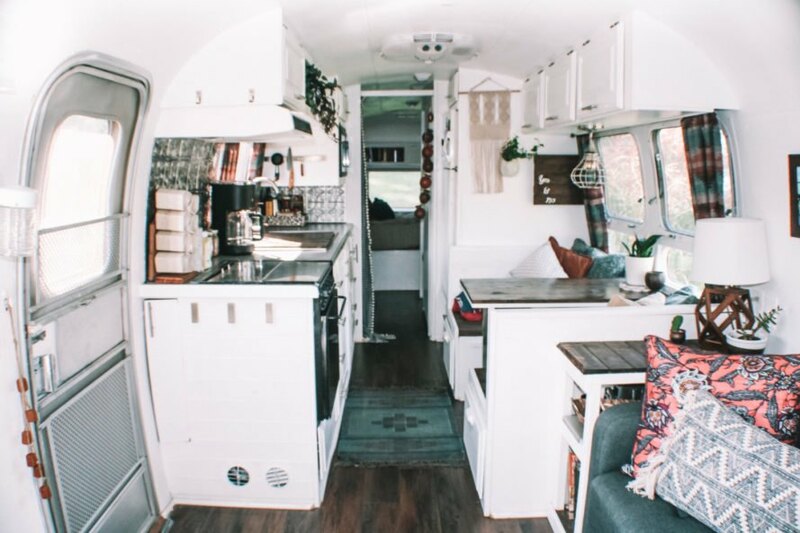 The best part of the tiny home is the kitchen, which was completely redone to create a simple and clean aesthetic. 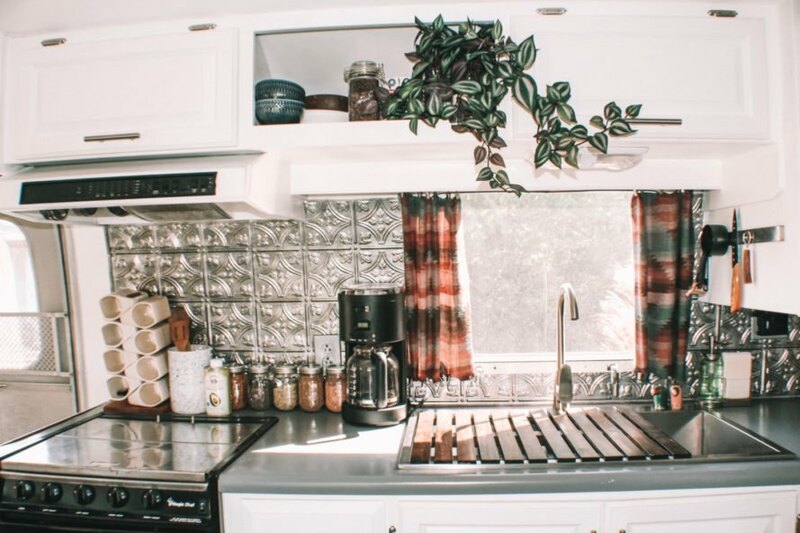 From there, Nate and Taylor added fun texture with a pressed tin backsplash and hanging plants. The couple also installed a working/dining cubical that faces the kitchen. A beautiful tabletop made out of reclaimed wood pulls double duty as a dining table and work space. A comfortable loveseat was placed in the living room, book-ended by a side table and shelving unit. 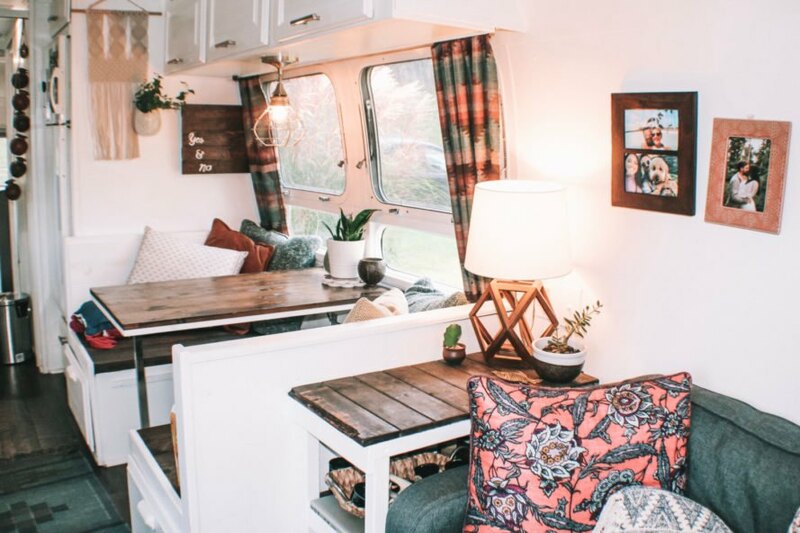 The dark wood on the tables, along with colorful pillows and a pendant light, give the space a welcoming, bohemian feel. A free-standing fireplace creates a warm and cozy atmosphere during frigid winters. 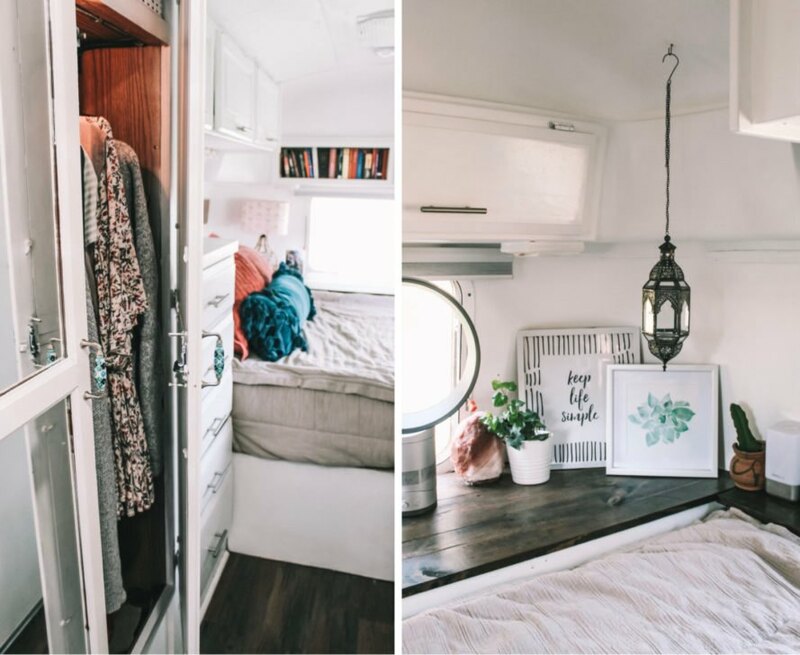 After years of dreaming of living in a tiny home, Nate and Taylor brought their ideas to life with Augustine the Airstream. 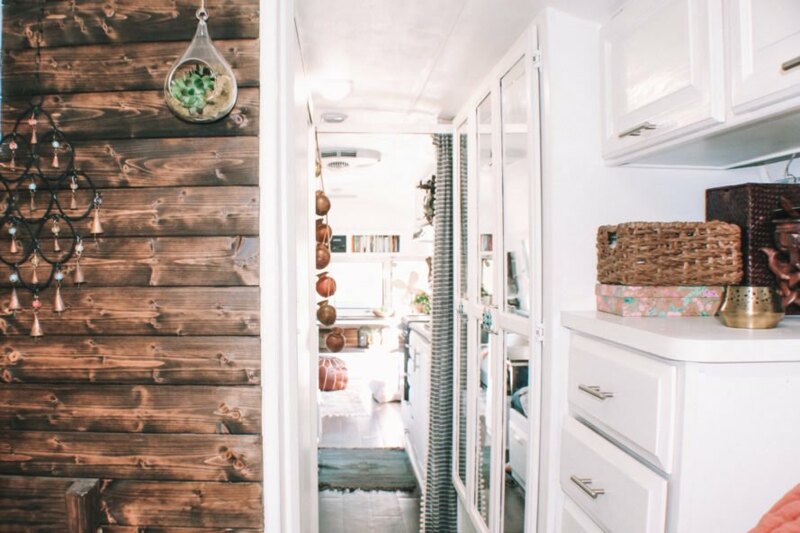 The couple converted a dreary old Airstream into a beautiful, light-filled home. Before photo of Augustine the Airstream. The couple installed a spacious dining nook in the kitchen. The dining nook book-ends the living area. White walls and several windows open up the interior. The kitchen has a pressed tin backsplash. The interior is bright and airy. Dark wood panels contrast nicely with the white walls. The bedroom frame was handbuilt by Nate. The bathroom was renovated into a bright and modern space. 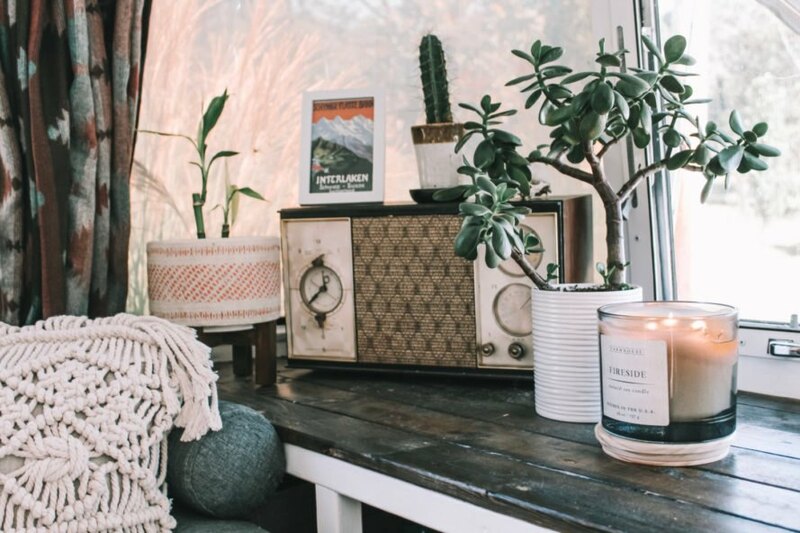 The home's decor is bohemian with several antique touches. Plenty of storage keeps the space clutter-free. 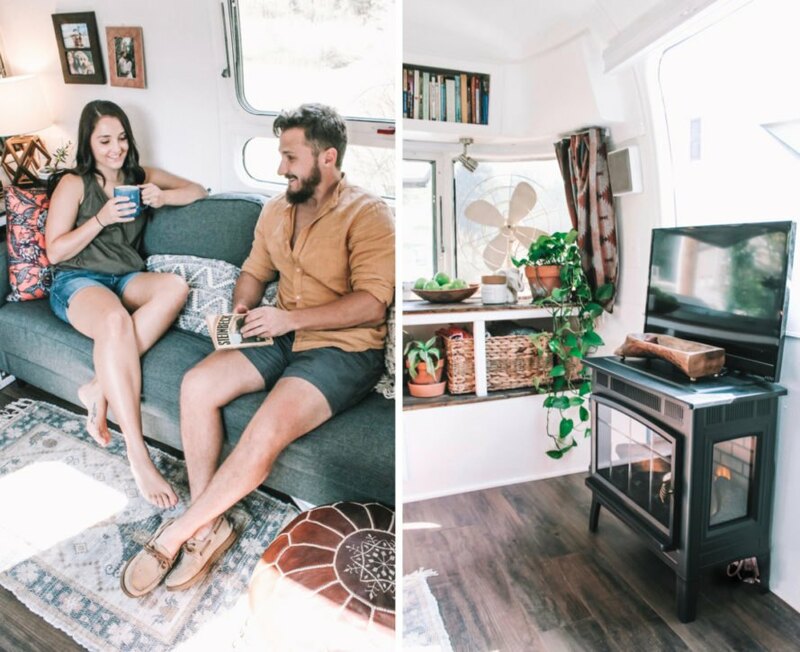 The couple designed the new layout of the Airstream themselves. Now, Nate and Taylor Lavender are enjoying life on the road.